Research coordinator Gary Mitchell reviews Problem Solving in Older Cancer Patients. The purpose of this award-winning book is to provide a collection of real-life case-studies as a resource for healthcare professionals, supporting older people living with cancer. The first section highlights some of the pertinent difficulties that healthcare professionals may face when supporting people living with cancer. The second section provides a practical series of case studies and resolves real-life scenarios in practice. The editors have carefully chosen a multi-authored team who draw on a wide range of clinical experience in the field. Furthermore, consideration has been given to the broader holistic needs of people living with cancer and receiving treatment. 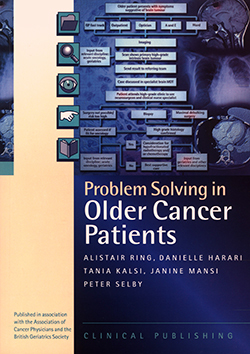 Given the increased incidence of cancer in older people, this book is timely and a valuable addition for nurses practising in an oncology or hospice settings. It is also a valuable resource for nurses who support older people in care homes and the community. Reviewed by Gary Mitchell, research coordinator at Four Seasons Health Care.